‘The question of a Church in the Tuffley Area had been considered in Canon Chard’s time. For this purpose he had secured a site in King Edward’s Avenue. This, however, was thought to be too near St Peter’s and eventually a new site was purchased in Southfield Road (in March 1933 for £883.15.0d. This site was held upon a Trust Deed dated 25th March 1933). The houses on the Lower Tuffley estate brought many new families to the district. For a time the problem was solved by running a special Sunday ‘bus service for Catholics in the Tuffley area, but in January 1943 this had to be suspended by order of the Ministry of Transport. On February 7th an experiment was made with a Mass at the New Inn, Stroud Road. About thirty-five people attended but the only room available was too small and the place was not central enough. On March 7th, (in his 1968 booklet he wrote 14th March) by courtesy of the landlord, Mass was said in the lounge of the Northfield Hotel. After a short time the numbers attending Mass so increased that it was necessary to move to the adjoining skittle alley. For over three years this skittle alley was the Tuffley Mass Centre. There was no heating, the lighting was poor and chairs and altar had to be packed away after Mass. In spite of these handicaps the number grew, and in 1946 a hut was purchased (for £15 from the Robinswood Hill Army barracks) and in August of the same year permission was obtained for its erection on the Southfield Road site. There were still many difficulties and many delays but Messrs. Costello and Kempe (contractors) and Mr. E. Whitmarsh-Everiss (architect) eventually managed to assemble all the necessary materials and in the Spring of 1947 the first Mass was said in the yet unfinished Chapel. On Sunday, July 12th, (in his 1968 booklet he wrote 13th July) the Chapel was formally blessed and dedicated to the English Martyrs. The occasion was marked by a Sung Mass and about one hundred and sixty people were present. The finished job far exceeded anticipations and the Chapel is very devotional, well heated and lighted. The electrical work was done by Messrs. Conroy and Owen. The Altar is a feature of the Chapel, and its reredos, portraying a representative group of English Martyrs, is the work of Messrs. Hardman of Birmingham. On 24th January 1949, a property opposite to the Church, No 8, Southfield Road, was acquired for £2,750 with the object of using it as a presbytery. In the event this was occupied by the caretaker. Well in 1965 a new building was constructed in Tuffley. The first Mass was celebrated on 30th January 1966 in the new English Martyrs’ Church, whilst it was still unfinished. The last Mass was celebrated by Monsignor Roche on 6th May 1979 when the church site, allotments and house opposite were sold to help to eventually fund the erection of a new English Martyrs’ Church in Tuffley Lane. When the family moved to Gloucester, Sunday Mass was being said in a hall in Southfield Road. This Mass centre was served from St Peter’s Parish Church in London Road, Gloucester. In 1947 a wooden hut had been transferred from Robinswood Army Barracks to the Southfield Road site. It was blessed by Father Roche and dedicated to the English Martyrs. This had been organised by Ernest Whitmarsh Everiss,(my father) who subsequently designed a semi-permanent brick building which was used as a Church Hall and Mass Centre. This was in 1966. Mass was said here until 1979. I had been acting as sacristan for some time and organised a Missa Cantata which was sung in Latin by Canon Roche, albeit in the Novus Ordo (6th May 1979). The Schola Gregoriana of Bristol University provided the choir. The Mass of the English Martyrs was not in the Missale Romanum at that time. I therefore produced a Missal for use on the day. It was done in an alphabet of my own devising which did not require the separate structure of serifs. The chant was rubricated. I constructed a page a night for weeks on end. After the Mass Canon Roche purloined the Missal and it has not been seen since. I also produced a Mass booklet which was printed by the CEGB. After Mass, Canon Roche, the servers and the Schola retired to Stroud Road where Pam kindly prepared a buffet lunch. The site in Southfield Road and a house opposite was sold to fund a new church hall in Tuffley Lane. The building looked like an engine shed. Whilst it was being built Mass was said at the Anglican Church of St. George in Grange Road. The first Mass was said in the new hall in 1980. For the next five years the hall was used as a Mass centre and I acted as sacristan and master of ceremonies. There was no resident priest. Two things of interest were brought from Southfield Road. Ernest commissioned from Hardmans of Birmingham a reredos depicting the armorial bearings of Sir Thomas More and John Fisher on its wings, the Tower of London and Tyburn, and figurative representations of Sir Thomas More, John Fisher, John Houghton, Cuthbert Mayne, Margaret Clitherow and Edmund Campion. Ernest designed a set of six candlesticks which were turned at the Robinswood Army Barracks. To the left of the main entrance is a black oak cross taken from the original mass centre in Southfield Road where it was mounted above the door. Below is a plaque giving the dates 1947-1980. Until 1980 we had never had the Holy Week Services. Given the co-operation of Father Fitzpatrick I set about designing and making the necessary equipment and training some fourteen altar servers. Meanwhile I had fitted out the sacristy using funds from jumble sales and my Christmas and birthday presents. This equipment is illustrated below. In addition 4 black and gold processional candlesticks were made en suite with the processional cross and a cross with two bases to be used on Good Friday. A large brewer’s funnel was converted for the fire on Holy Saturday. Various other pieces were purchased from junk shops and restored. Cope Stand – cope stand constructed in American whitewood on a mahogany base weighted with self-lubricating bearings from an excavator. Bearing clamped in a wooden detail. Cope arm in mahogany. Paschal Candle – Made in American whitewood and mahogany with a heavy base detail for stability. A set of four lectern covers in white, green, red and purple were made. Processional Canopy – Made in the form of four support poles with brass ferrules at their ends. Each pole has at its top an onion-shaped cap with brass female threaded detail. A male brass stud detail enables the canopy fabric to be trapped between a pair of white felt washers. A storage stand supports the poles when the canopy is not being carried. A cruciform structure locks the tops when the canopy is removed. To obtain vertical stability the base is weighted using brass bearings. Display Stand – Supports two Perspex sheets. Made in American whitewood and mahogany. Base design weighted with brass bearings. Display supports made from War Department arrow stamps. Note uniformity of design between stand, the canopy rack and the cope stand. Tabernacle – constructed in wood. Brass fretted detail forming the crown made from scrap (parts of a lamp). The figure (of Christ the High Priest) was purchase. Tabernacle and Candlesticks – Tabernacle consists of a wooden base enclosing a metal safe. The door is decorated with metal plates of differing colours and paste stones. Brass base, cap and cross. Restored by dismantling, polishing and lacquering individual components, spraying base, reassembling and re-setting stones. Originally made by Peter Staley’s father. Missal Stand – Given two missal stand by Prinknash Abbey. ‘Perhaps you can make one out of two.’ They had been in a loft adjacent to a leaking flue and were encrusted with soot. Support has been repaired with splints and wire. Book rest internals remade. Whole cleaned and polished. Candle snuffer, received flat. Raised initially on a ring stake. Hardwood stake turned. Body raised. Not necessary to anneal. Filed up, polished and lacquered. Legilia -Used to support the evangelarium during the singing of the Passion. Frames made in American whitewood,knobs in mahogany. Book support in red goatskin supported on kitbag canvas. Now at St Saviour’s, Bristol. Processional Torches – 6 Torches in American white wood with mahogany details and support. Processional Cross – Designed for the Stations of the Cross, hence no figure. Made in American whitewood with mahogany fittings. Painted matt black with gilded details. Ferrule and cross pate in brass. Cross on both faces centred with a cabochon amethyst. Now at St Saviour’s, Bristol. Incense Boat – Turned in mahogany, hinged lid. Top decorated with an oval agate. Holy Water Stoup – Back pane in alabaster and lid in cup broken beyond repair. Back plane replaced with marble, hinge filed away, straightened, polished and reassembled. Set of fourteen Stations of the Cross – These Stations of the Cross are late Victorian photographs of wood carvings c. 1900. These had been very damp and the emulsion had denatured, forming a ‘loose’ powder. The V&A advised that they could not be restored. However, they were carefully removed from the frames and the glass removed and the emulsion held with a sprayed on fixative. Where the emulsion was missing and damaged this was repainted using a photographic spotting kit in grey, black and sepia. The frames, where damaged, were restored, cleaned and revarnished and the stations reassembled. Kneeler, found in junk shop. Cut down to size, remade and stained. Silver Plated Thurible – Damaged; beaten out from the inside and polished. Brass Thurible – Badly damaged. Beaten out and polished. Chain links replaced. Oak Crucifix – Oak cross and figure. The joints in the arms of the cross and the cross itself had to be re-made. The whole was splattered with emulsion paint. It was thought to be beyond repair. Having discovered how it was made it was dismantled and scraped over the whole of the surface to maintain a uniform colour, reassembled, remaking the joints, and sealed with varnish. Now at St. Saviour’s. All the Holy Week ceremonies were carried out with great dignity and as much tradition from the Tridentine rite as possible. The Rt. Rev. Mgr. Provost Matthew J. Roche Prot. Ap., V.F. Relics were then deposited in an aperture prepared in the mensa of the altar. Chrism was poured in the middle and on each corner of the altar table and then spread across the whole surface. The walls were marked with Chrism in twelve places but only eleven of our twelve candles tonight mark those original places! The altar and church generally were then incensed, the altar prepared and the candles lit in readiness for the celebration of the Mass. For those present that night this must have been a memorable event and the consummation of labours carried out over a period extending back in excess of fifty years. In 1988 Canon Joseph Chard may have been remembered by a few of those present. He was Parish Priest of St Peter’s from 1894 until 1934 and he is arguably the Father of our Parish. During his final years he spent his energies raising money for a new church in Gloucester. A site was acquired in King Edward Avenue but it was decided to build further south and a site was acquired in Southfield Road. In 1939 his successor, Monsignor Provost Roche, wrote ‘whenever and wherever the new church is built it will in a sense be Canon Chard’s memorial’ On Sunday 13th July 1947 the Church of the English Martyrs was formally blessed and dedicated in Southfield Road. Our church here is its successor. During the time I was curate in Taunton, back in the mid 1990s, my boss Monsignor Provost Lynch talked of retirement. He would sit into the night making plans and in response I would spend the next day sorting through cupboards and drawers helping him to down-size in readiness. In the event he was to see me off but that is another story. One day I was sorting through a drawer and I came across this little black book. It is an account book with entries covering the period 1925 to 1949. A few names and references jumped out from the page and I decided not to chuck it – Whitmarsh Everiss, Costello, Hardmans, Southfield Road, Tuffley. Yes this little book contains the accounts for the building of the church opened in 1947. How did this book end up in Taunton well the young Patrick Lynch began his priestly ministry in Gloucester during the summer of ‘48 so he may have acquired it. The reredos and the corpus on our crucifix are probably the only other tangible links that we have today with the events that are recorded in this pocket book. As many of you will know, three buildings were eventually erected for the celebration of the Mass on the Southfield Road site; at least three pubs – The New Inn, Northfield Hotel and the Pike and Musket – were used for Mass. Like Moses we have pitched our tent of meeting in many places on our journey here. Two houses were also bought and sold before our purpose-built presbytery was built. Priests as well as buildings have come and gone too. But one thing has remained constant and that is this community of faith. It has evolved and developed. Thirty-five attended the first Mass at the New Inn and 160 attended the service in July 1947. Numbers have grown since, fluctuated and even declined a bit. New people have come and others have passed away. Many, many, new houses have been built and our congregation today draws people who have been born in numerous places around the globe. It certainly involved bold steps and tremendous vision to first acquire and then, in 1979, to develop this present site. In 1988 the project must have seemed to be nearly complete but today, twenty-five years on, we are busy raising money again for our new meeting room. This room will, in many ways, become a symbol of the strength of our communal life here. Not only do we gather to celebrate Mass but flowing from this is the impetus to build community and to draw others in. It seems ages ago that Bishop Declan began to make us think about communion and mission. As we know Church is not fundamentally about buildings or clergy but about the people who gather here Sunday by Sunday – who gather to be Christ for others. Tonight we mark these past achievements, we ponder the rich patrimony which has been entrusted into our care by our spiritual mothers and fathers who often gave sacrificially to provide it. Let us give thanks to God and commit ourselves anew to loving and serving the Lord as best we can. Many of the families who came to Gloucester and settled on these estates had very little in the way of material possessions but they developed something here of rich quality which has stood the test of time. Like the house built on rock this parish is built on firm foundations. To talk tonight only of mitres, of clergy and titles and rites and ceremonies, is to miss the biggest part of the story. So if you were here twenty five years ago and wish to remember recall all the people in the pews, some still here and others not, remember what they used to do, catch their smiles. You have something very precious here and you encounter it in each other. All the things that have gone on here – the hatching, matching and dispatching, the sacraments received, the fun, the laughter, the tears shed – that is what tonight is fundamentally about. It is surely about each one of us wanting to be a part of the story and of not taking each other for granted; it is about sharing our faith with new people and of wanting to pass all that we have on to them and to future generations. Thank you for allowing me to be part of your story too. ‘Father in heaven, source of holiness and true purpose, it is right that we praise and glorify your name. For today we come before you to dedicate to your lasting service this house of prayer, this temple of worship, this home in which we are nourished by your word and your sacraments. The Church is fruitful, made holy by the blood of Christ: a bride made radiant with his glory, a virgin splendid in the wholeness of her faith, a mother blessed through the power of the Spirit. The Church is holy, your chosen vineyard: its branches envelop the world, its tendrils, carried on the tree of the cross, reach up to the kingdom of heaven. The Church is favoured, the dwelling place of God on earth: a temple built of living stones, founded on the apostle with Jesus Christ its corner stone. The Church is exalted, a city set on a mountain: a beacon to the whole world, bright with the glory of the Lamb, and echoing the prayers of her saints. Lord, send your Spirit from heaven to make this church an ever-holy place, and this altar a ready table for the sacrifice of Christ. Here may the waters of baptism overwhelm the shame of sin; here may your people die to sin and live again through grace as your children. Here may your children, gathered around your altar, celebrate the memorial of the Paschal Lamb, and be fed at the table of Christ’s word and Christ’s body. Here may the poor find justice, the victims of oppression, true freedom. 50 years ago Britain entered the BIG FREEZE, one of the coldest periods in recorded history. I can just remember the snow piled up for months on end. Politically it was a tricky time too; the world had gasped during the summer as the Cuban Missile Crisis unfolded and it yawned as Vietnam dragged on and on. The British waved tricolours as we signed up for a supersonic Concorde deal with France. As the year closed young people bopped to LOVE ME DO whilst others turned to those new stars which arose in the east – the Rolling Stones. Local boy and tragic idol, Brian Jones, had christened the new band in that year. Local links were forged in later years with another Stone,drummer Charlie Watts, as he settled in his gothic fantasy world of Foscombe, near Ashleworth. 30 years ago I had the thrill of negotiating his long muddy rutted drive on my police bike to quiz him about his pack of dogs and to extract cash from him for parking fines. Then there was Vatican II. The first session closed 50 years ago in Rome. I have to say the council meant nothing to me at the time as I was only four. Although at Secondary School, a decade later, I remember being stunned when an RC friend told me he had never even heard of it. It was and still is immensely important – not because of changes to the Liturgy, or because prelates cut their trains and abandoned purple socks nor because the Pope set aside his be-jewelled ‘Noggin the Nog’ hat. Its importance for me was that the Church, at the summit of its success – with packed churches, new churches, new schools, fine colleges, bulging seminaries, flourishing convents, with mission plant peppered throughout the world – turned and looked outwards. It didn’t need to and yet it did. As we all know ecumenical co-operation can, so often, arise out of sheer desperation – empty churches and expensive and scare resources can force issues. As we know too, churches can also dream up schemes to catch the attention of the indifferent, so as to seem cool and relevant, when they rarely are! Vatican II was not like this at all. It didn’t have to happen and yet it did – and its whole spirit-filled dynamic was to reach out and draw together. To reach out to other churches, to other faiths, to the Jews, to the world at large. And the fathers of the council kept on asking themselves what do we share in common? How can we present our faith in a way that will unite and not divide? In humility they asked the even more costly question – what can we learn from others? Well, with fellow Christians, we turned to the bible, our liturgy, our life of prayer, our common baptism and our service to the world. The fathers asked how we could all, yes together, make the modern world, Christ’s world, a better place? So, instead of condemning non-Christians, they suddenly became collaborators – we celebrated with them what we had in common yet respected what still divided us. Admittedly, not all the world was suddenly ‘on side’ and 1962 was the year in which Fidel Castro was excommunicated and other reds were pulled from under the bed. But the documents which resulted from the Council changed the whole church and we can take so much of it for granted. It seems a little sad when a rising generation pines for the churchy trappings of yesteryear. Amid all this excitement and change, things happened here in Gloucester too. Over a few decades the Catholic community had burst out of its cramped down-town premises in the London Road and had built brand new infant, junior and senior schools together with churches in Brockworth, Churchdown, Tuffley and yes, the one we are celebrating the beginnings of here today. At the helm was first Canon Chard and then, from 1939, Canon Roche both men of real vision and immense ability. We know the story – it unfolds like the stories of so many Catholic parishes – the Mass in the pub, the fundraising, the stone laid and then the church opened. Perhaps the sadness today is that we lack the zeal, vision and passion of those who built this church. I think they would probably be saddened to see the size of our congregation now when the population in our parish has grown like topsy. I suspect they would be disappointed at our lack of engagement with the wider community and our lack of confidence. We are not alone – the data gleaned from the 2011 census confirms that decline is nationwide! So today, we celebrate our history but tomorrow it is back to work. Perhaps John the Baptist can offer a hand as we toil. He calls us to stand-up for social justice. He says to the rich, the tax collector and the soldiers play fair. Take what is rightly yours and no more. In this way he brought hope to the people of his time – liberation, the dream of a different sort of society. John was not advocating revolution or a violent regime change to achieve it. He was not shouting for people to run to the barricades. He was not like superstar, Che Guevara, of 1962. John spoke courageous words, like Amos of old, but words that could be turned into action if people’s hearts were only changed, if they were less selfish. John unveils a simple Gospel of Kindness. Simple words like these lie at the heart of Jesus’s concept of the Kingdom too. This is the sort of message that he preached in the towns and villages around the shores of the Sea of Galilee. The sadness is that, as we reflect on over 2,000 years of Christian civilization, Christendom has not always reflected these values. Our society has tolerated poverty, the abuse of the vulnerable, the poor and the weak have suffered exploitation and the boundaries of the Kingdom have often been advanced by coercion and the sword. The words of John the Baptist, although set in a specific circumstance, a small occupied outpost 2,000 years ago, they can still resonate today. They are timeless words. As we mull over the simple words of Jesus in the Gospel, and act upon them, we can be changed by them. If we are changed, if our neighbours’ lives are changed, then the whole of society might be gradually transformed. In this way the Kingdom of God is advanced. One of my secular heroes of the moment, Peter Tatchell, has pertinently expressed this: Don’t accept the world as it is – dream of what the world could be and then help make it happen. The willing co-operation of many people has made this publication possible and is gratefully acknowledged. To my husband, Ian, for all his support and assistance. Those who answered my queries so patiently, provided photographs, booklets and newspaper articles. Especially to the typist and to one who wishes to remain anonymous. Members of the Gloucestershire and North Avon Catholic History Society for invaluable assistance and suggestions. The staff of the Gloucester Local History Library and Gloucester Records Office. Rev. J. A. Harding – Diocesan Archivist. Those who read through the proofs. I am happy to have this opportunity to send greetings to St. Augustine’s Parish in Matson. As the name implies, a Silver Jubilee is a precious occasion, a special opportunity to express our gratitude to the Lord. As the Psalm says, ‘Unless the Lord build the house, in vain do its builders labour.’ Surely this is specially true of a church, a house of God. We thank God for the many ways in which He has blessed this church and this parish. God works through people and so we also remember with gratitude all who have played a part in the original project and in the equally important work of building up a parish community of St. Augustine’s. This is a labour of love in every sense of the word and we salute those who have been prominent in parish life and also those who have quietly busied themselves with the ordinary, but essential, tasks. We think of all who have shared in the ‘one thing necessary’, the prayer life of the parish. Warm congratulations to Father Eddie and all the parishioners on the Silver Jubilee of St. Augustine’s. This past ‘year’, bridging 1987/88, has been and continues to be a special time for us. Indeed, it is a very special year for several other important celebrations: the Marian Year, proclaimed by our Pope John Paul II, to honour Our Lady and ask her prayers as we prepare to enter the third Millennium of Christian Faith in the year 2000, the Millennium of Christianity among the Ukrainian and Russian people, the sixth Centenary of the Faith among the Lithuanian people, the Tercentenary of the Western District, the former area including our present Diocese today, which was one of the four Catholic Districts in England and Wales administered by a Bishop (the Vicar Apostolic) set up in 1688 by Pope Innocent XI after the Reformation, the 250th anniversary in honour of John Wesley, the Year of the Diocesan Synod – the pastoral gathering of the ordained and laity of the Diocese with our Bishop, the Year of the Anglican Lambeth Convocation, the 150th anniversary of Oscott College Seminary, where many of our students for the Diocesan priesthood train. Last, but not least, the bi-centenary anniversary of Australia, (not forgetting our Australian author!). For us, the 27th May is the 25th anniversary date since the late Bishop Rudderham came to bless our then, new, parish church. All these anniversaries are ‘turning points’. Jesus celebrated turning points and used them to lead people forward. He called people to ‘Come’ in order to ‘Go’ in His name and share what they had received. Our Silver Jubilee is for us that Christ-given opportunity and challenge to our established and new parishioners together to ‘come’ in communion to, and with, Our Lord, and each other, in order that we may ‘go’ to further His work ‘in peace to love and serve the Lord’ by our loving one another, ‘so that the world may believe’. In the comings and goings of Christ and His followers through the ages, what matters is that we try and persevere, not whether we succeed: only God can grant that. ‘The greatest failure is not to have failed, rather, it is not to have tried and not to have persevered’. May we all continue the work of God’s Kingdom in all we think, do and say as members of His family. This booklet was produced to commemorate the Silver Jubilee of the building of the church of St. Augustine of Canterbury, Matson, and the Dedication of our church on May 27th, 1988. The booklet consists of three sections: an historical background of Matson and Catholicism, the origin of St. Augustine’s and finally, St. Augustine’s as it is today. New parishes do not appear overnight. The efforts and devotion began even before the start of our story. In the dark days of Penal Laws was sown the seed which is still bearing fruit today. Through those dark days run the slender links which bind us to pre-Reformation Gloucester. Without the past, there would be no present. A study of history invariably leads us to a greater awareness of the present and perhaps to an idea of what may lay ahead. The reader is invited to look back and remember with gratitude the challenges, triumphs and foresight of those involved in the origin and development of our parish. The parish church gives identity and continuity to parish life. It links us with those who built the church and those generations to come who will kneel and pray where we kneel and pray. This section, which covers the period from 1066 to the late 18th century, is an account of Matson, its neighbouring churches, effects of the Reformation, local martyrs and, finally, the establishment of the Gloucester Mission. Matson is pleasantly situated two miles east of Gloucester along the slopes of Robinswood Hill. The name of Matson does not appear in the Domesday Book. However, the entry for Barton in the Hundred of Dudstone includes a reference to two freemen holding two hides (240 acres). These can be identified from later evidence as being the later Manor of Matson. During the reign of Henry III, the name of the Manor was variously spelled as Mattesdune, Matesdon and Matesden. It is possible that Mattesdune is derived from ‘matte’ (a meadow) and ‘dune’ (a down). Before the Norman Conquest, Gloucester was a centre for forging iron ore found at Robinswood Hill. The hill was not only important for its iron deposits, but also for its springs which supplied the city of Gloucester with water from mediaeval times up to the early 19th century. Matson was a neighbouring parish to Gloucester, which became a city in 1483. There were eleven parish churches in mediaeval times, as well as a number of religious communities. These included the Dominicans or Blackfriars, the Franciscans or Greyfriars, the Carmelites or Whitefriars (who had a house on the site of the present bus station), the Augustinian Canons of St. Oswald’s Priory and the Benedictines of St. Peter’s (now the Cathedral). There were Augustinian Canons at Llantony Priory, which was just outside the town walls. There were also religious buildings in Matson’s surrounding area. Prinknash Park was given to the Abbey of St. Peter in 1096 and held by the Abbey until the Dissolution. The Abbot built a chapel at Prinknash at the hunting lodge (now St. Peter’s Grange) in the 14th century. In 1928 the house again became the home of the Benedictine Monks. The nearby churches of St. Leonard at Upton-St.-Leonards and St. Lawrence at Barnwood also belonged to St. Peter’s Abbey. Matson had its own parish church, dating back to mediaeval times. A church at Matson was granted to the Abbey of St. Peter between 1113-1130. The pre-Reformation building remained until 1730, when the nave was demolished and rebuilt. The chancel was also rebuilt and the church dedicated to St. Katherine in 1893. The original dedication is lost. It is interesting to note that St. Augustine’s stands on the site area of an ancient church. It is situated on the boundary of two fields, Moat Leaze and Chapel Hay – the latter adjacent to Painswick Road. The late Canon Bazeley, Rector of Matson from 1875-1923, believed that a church existed near the site of the present St. Augustine’s. A chapel certainly existed at Matson in 1100 when the de Mattesdunes were lords of the manor. Their manor house and church stood in the field on the north side of Robinswood Hill, known as Moat Leaze. Excavations in 1953 in Moat Leaze revealed evidence of a mediaeval manor house and moat, along with pottery from the 12th or 13th century and Saxon loom weights. The Dissolution of the Monasteries (1536-1538), when the majority of the monastic buildings was destroyed, would have had a major impact on life in Matson, along with the religious changes which gradually led to the creation of the Established church out of communion with Rome. The Mass was suppressed and finally abolished under Elizabeth Ist. The Dissolution, the rejection of papal supremacy and the suppression of Mass were severe blows to the Catholic faith. Services in English and changes resulting from the Reformation were accepted by the majority of people in Gloucestershire. However, the survival of Catholicism was due to a number of families who did not accept Elizabeth’s religious settlement and chose to cling to the old religion. These families were able to offer hospitality and refuge in their homes, providing not only secret cupboards for safe concealment of sacred requisites but also hiding places for the priests when needed. These families were liable to fines for not attending Anglican services. Priests and those discovered helping them were subject to severe penalties. Gloucestershire can proudly claim as a son the first Missionary priest to arrive in England from the college at Douai. Fr. Lewis Barlow was born in Gloucestershire and soon after his ordination, he volunteered to return to England, in 1574. During Queen Elizabeth 1st’s reign almost 200 priests and lay people were put to death. Gloucester has links with eight martyrs of this period, two of whom were priests who met their deaths in the city of Gloucester and one who has an association with Matson. Blessed John Pibush served at Gloucester in 1589 and four years later was arrested at Moreton-in-Marsh. On being charged with treason, he replied, ‘If to be a priest is a traitor, then I am one. I thank God for it.’ After a year, he was sent to Gloucester gaol. On 19th February, 1594, he either engineered or took advance of a mass break-out of twenty prisoners. He was recaptured the next day at Matson and was sent to London. Several years’ confinement ruined his health. He was executed on 18th February, 1601 at Southwark. During the 17th century the size of the local Catholic community steadily declined, probably as a result of the crippling fines and the lack of clergy. It was almost impossible for the few remaining Catholics to receive the Sacraments. In addition to a few families in Gloucester, the most prominent wealthy Catholic families included the Pauncefootes of Haresfield, the Comptons of Hartpury, the Jerninghams of Painswick, William Norwood of Leckhampton and the Theyers of Coopers Hill. These recusants would have sheltered clergy from time to time and Mass was no doubt held in their homes. There was a brief revival of Catholicism under James II. When he came to Gloucester in the early part of his reign, he heard Mass in the chapel over the Sheriff’s court. He sent Fr. Pius Littleton (alias Westcote) and Brother Wilfred Reave OSB to Gloucester. But this brief, attempted restoration resulted in anti-Catholic reaction. New penal laws were enacted and previous laws enforced. Catholicism was forced underground once more. There is no record of ‘papist’ families in Matson in the recusant lists for 1715 and 1716. The 1773 returns of the Vicar Apostolic of the Western District (1763-97), Dr. Charles Walmsley, gave 210 Catholics in the whole of Gloucestershire, under five Mission priests. The second Catholic Relief Act became law in 1791 and Catholics were then able to practise their faith openly for the first time in more than two centuries. Matson was part of the Gloucester Mission which started in 1787. The first resident priest in post-Reformation times, Fr. Gildart, came to Gloucester in 1788. During the 1790s, Fr. John Greenway had the first public Catholic chapel erected in London Road, which was dedicated to St. Peter. By 1813, the Catholic population in the city of Gloucester was 40. In 1859, the building of the present-day St. Peter’s began. The church was completed and consecrated in 1868. The Gloucester religious census for 1851 gives one place of Catholic worship with 310 attending over the three Services. The few Catholics who might have lived in the Matson area would have been served by the priests of St. Peter’s – in particular Canon Joseph Bernard Chard (rector from 1894-1934) and his successor Mgr. Matthew Roche, the founder of our own parish at Matson. For many years after the Reformation Catholics practised their religion with great difficulties. The small, loyal congregations built up by the Seminary priests laid the foundations for a day they could not hope to see themselves – when the Catholic faith would flourish again in England. Gloucester’s population was expanding and the building of Matson commenced in 1946. The first Mass in Matson was celebrated six years later. Ten years after this and three Mass centres later, the building of St. Augustine’s began. At this stage it is important to acknowledge our debt to the invaluable work of Mgr. Matthew Roche, Rector of St. Peter’s. Churchdown, Brockworth, Tuffley and Matson parishes, besides the three city Catholic schools, are largely the result of his endeavours. In 1983, at the beginning of his 50th year in Gloucester, he was forced to retire due to ill health. The first Mass in Matson was arranged and celebrated by Mgr. Roche on December 21st, 1952 in the canteen of Laing’s (the builders of Matson) near Munsley Grove. The local Catholics who owned cars attended St. Peter’s, while those within walking distance attended Mass in the canteen. The Cunningham family, who lived nearby, held the canteen keys. They unlocked the canteen for the 10.45am Mass and arranged benches. After the workmen left at 1pm on Saturday, the floor of the canteen was washed to remove the heavy red soil deposited by the workmen’s boots. The congregation, numbering 50-60, sat on the workmen’s benches and knelt on newspapers, as the floor was damp. Trestle tables, used by the workmen for meals, formed the altar. An harmonium was played by Mr. Highnam. Eric Parsons acted as chauffeur for Mgr. Roche and also served at the altar. Fr. Matthew Hayes, the late Fr. Patrick Cronin (from St. Peter’s), Fr. Gerard Rogers and Fr. James McGuire (from Blaisdon) celebrated Mass here. Fund-raising events were organised by St. Peter’s. These included coffee mornings, jumble sales and fêtes and bingo greatly helped to boost funds. The canteen was used as a Mass centre for several months. After the builders left in 1953, Mgr. Roche arranged for Mass to be celebrated in the community centre in Redwell Road. After the dances, which ended at twelve on Saturday nights, the hall was swept, toilets cleaned and chairs placed ready for the 10.45am Mass. Tables were used for the altar. A local Polish Catholic family laundered the altar linen. Fund-raising activities continued to be organised. Coffee evenings were held in the parishioners’ homes, where various items, such as flowers and vegetables, were brought and sold. On January 2nd, 1959, a notice in the local press announced that the community centre would no longer be available for Mass. The City Council also stopped the use of the hall by other organisations, such as Toc H. The reason given was that the lettings were against the constitution of the community centre and had been made after a misunderstanding. Bookings had been taken to raise money to pay for the maintenance of the hall. It was also felt that organisations using the centre should have their own centres. However, there was room at the inn – by courtesy of Mr. Storton and the Cheltenham Brewery, the skittle alley of the Musket was made available for Mass. As there was only concrete to kneel on, the ladies made kneelers which were hired out for a penny or whatever one could afford. By the time St. Augustine’s was built, £19 had been collected by this means. The Combined Funds campaign was introduced by Mgr. Roche on August 4th, 1960. The objective was to obtain fund offertory promises in excess of £36,000 over a three year period. All collections would be consolidated into the one Sunday offering. This involved collectors visiting every Catholic wage-earner in the parish. £20,000 for a new church to be built at Matson was one of the campaign goals. Eric Parsons and Tom Murphy (who was an altar server at the Musket Mass centre) collected in the Matson area on Sunday mornings. For three and a half years, until September 1962, with the altar near the dartboard and the bar for a background, the Musket Inn became the last temporary Mass centre for the Matson Catholics. St. Augustine’s was built to meet the needs of an ever-increasing population. The church site, an area of open ground, was purchased for £1,000 from the City Council on 19th January, 1960. Mgr. Roche commissioned architects Egbert and William Leah of Gloucester to design the church. The general contractors were Brennan Brothers of Gloucester. The Foundation Stone, containing a copy of the plan, the Deed of Dedication, local newspapers, medals and coins was laid on 22nd February, 1962, by Mgr. Roche. Frs. Matthew Hayes and the late Patrick Cronin were also present. The cold, biting wind did not deter local Catholics from turning out in strength for the ceremony. The total external length of the church is 92 feet, the width 41 feet and the height 35 feet. The church seats approximately 256. It consists of a nave, with a centre and side aisles, a deep Sanctuary, a side chapel and circular baptistery, now the Lady Shrine. An atrium, the full width of the building, is separated from the main body of the church by a clear glass screen. The purpose of this was to allow parents with restless children to retire there and continue to take some part in the service and leave the congregation free to concentrate without distraction. Above the entrance is a balcony with additional seating. The main structure is in specially pre-cast white concrete and consists of seven pairs of portal frames with concrete purlins and beams. The portal which supports the stained glass window weighs seven tons! The main arch consists of crushed Portland stone and white cement. The erection of the portal frames and purlins was completed in four days. In the gable over the entrance are five narrow windows. The centre window is a magnificent stained glass panel, depicting St. Augustine of Canterbury. This was designed by Pierre Fourmaintroux of the Whitefriars studio. The original electrical underfloor heating, with removable elements, proved to be unsatisfactory: even when switched on overnight prior to Mass, the heat provided was insufficient and earlier switching on was too expensive. The main altar, composed of Portland stone, cost £230, which included the cost of installation. The original main altar top was found to be damaged. After trimming it was placed in the side chapel. The tabernacle, in the Blessed Sacrament side chapel, was crafted by a parishioner of St. Peter’s. The mahogany seats and sedilia were constructed by Herne and Company, Waterford, Ireland. The two altars, crucifix, font, lectern and cantor’s desk were constructed by Boulton Brothers of Cheltenham. A striking feature of the church is the life-sized crucifix in colour, for which the ‘Crux decusata’ was used instead of the usual form. This was inspired largely by the evidence of the Holy Shroud. The cross is of oak, roughened and polished. The figure of Christ was carved from limewood, by Patrick Conoley of Boulton Brothers (Cheltenham) and painted by a Birmingham firm. The total cost, including furnishings, was £32,000. This was raised by the local Catholic population. Lack of finance meant that a hall and a priest’s house could not be built at the time. Mgr. Roche celebrated the first Mass in St. Augustine’s on September 30th, 1962. In the absence of Mgr. Joseph Rudderham (Bishop of Clifton Diocese from 1949-74), who was in Rome for the Second Vatican Council, (the gathering of all the Bishops of the Catholic Church), Mgr. Roche blessed the church on Thursday 4th December, 1962. Frs. Matthew Hayes, Tim Crowley and Christopher Lloyd (who, with Mgr. Roche, was responsible for Matson) also took part. Other priests present were Fr. Lawrence Walsh O’Carm (Prior at Whitefriars Independent School in Cheltenham) and Fr. James McGuire (the then newly appointed Father Rector of Blaisdon Hall Salesian School, Longhope). Mass was celebrated after the Blessing. Those attending St. Augustine’s contributed toward the cost of altar linen, the altar Missal and stand, bell, holy water stoop and other requirements. Bishop Rudderham celebrated Mass on May 28th, 1963 –then the feast of St. Augustine of Canterbury. The mayor, the late councillor Ben Cooke and Sheriff (Mr. J.E. Holohan) were present. The first baptism took place on 4th August, 1974. The first wedding was on 28th November 1963. From a humble workmen’s hut, through a succession of varied Mass centres, sprang the foundation of our church and parish. St. Augustine’s was created a parish in 1974. The next fourteen years saw a succession of five resident priests – during a time of change, new challenges, new ventures and, above all, progress, which continues. For twelve years St. Augustine’s was an additional Mass centre served from St. Peter’s. On 15th June, 1974, Bishop Rudderham established St. Augustine’s as a parish and appointed Fr. Michael English as the first parish priest. A bungalow ideally situated near the church was purchased on May 17th, 1974, at a cost of £16,750, for use as the parish priest’s residence. Up to 1974 there was only one weekly Mass at 10.45am on Sunday. Since the establishment as a parish, there has been a regular daily service, with Sunday Masses at 10.30am and 6pm. The church now served the areas of Matson, from Finlay Road, Coney Hill, the Heron estate, the village and surrounding areas of Upton-St.-Leonards. In 1973 there were about 150 regular worshippers. This number increased to over 300 by 1974, the year the weekly parish bulletin was started. The social aspect of the parish included coffee evenings in the parishioners’ homes, visits to Clifton Cathedral, youth excursions to Downside 75 and a parish social at Saintbridge Sports Centre to coincide with the feast of St. Augustine, the patron saint of the church. Matson was supported as a poor Mission for two years. On Sunday, 15th June, 1975, St. Augustine’s celebrated its first anniversary as a parish. A replica of the anniversary cake was made specifically to enable souvenir photographs to be taken. The first summer fête was held at Robinswood Infants School on July 12th, 1975. Subsequent fêtes were held in a marquee where the hall car park is today. Having no hall, meetings were held the bungalow (resident parish priest’s home) or, if large numbers were present, in the church. Volunteers cleaned the church and arranged flowers. House Masses were held from time to time. During 1975 the main altar was re-positioned several feet towards the main body of the church. This was to enable to priest to celebrate Mass while facing the congregation. Fr. Michael English was parish priest for three and a half years. In 1983, he was appointed to St. Peter’s, Gloucester, when Mgr. Roche retired and is at present Rector there. Fr. 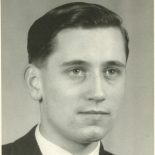 John A. Supple was resident parish priest from 1977-78. He is currently parish priest of St. Gregory and the English Martyrs, Salisbury. During the several months before the appointment of the next parish priest, Fr. Bruno Bradley (from Birmingham) celebrated Sunday Mass. The monks from Prinknash Abbey conducted services on feast days and Holy Days of Obligation. The late Fr. Gerard Anthony Carroll, born 1920, studied at St. John’s Seminary, Waterford and was ordained in 1944. He was parish priest from 1978-80. Frs. Michael J. Fitzpatrick and Leo M. Porter (from St. Peter’s) served Matson until the appointment in 1981 of Mgr. Donald McMillan. He was born in 1925 at Newcastle-upon-Tyne, attended Oscott Seminary and was ordained for the Diocese of Clifton in 1948. The main development during his time at St. Augustine’s was the construction of the parish hall. The function of the hall was to provide facilities for social and religious activities. The Building Committee consisted of those with practical experience, including a local electrician and bricklayer. Project Construction Limited, Bristol, designed and built the hall. Work began on September 7th, 1982 at a cost of £65,000. Part of the cost was met by loans and fund-raising by parishioners. In May, 1983, after celebrating Mass, Dr. Mervyn Alexander, Bishop of Clifton, opened and blessed the hall. This was followed by an informal reception in the hall. The development of the hall enabled the Cubs, Scouts, Brownies and Girl Guide organisations to be formed. Parish meetings, bazaars, dances and bingo continue to be held in the hall. In April, 1985, Mgr. McMillan was succeeded by Fr. Eddie Peach, the 5th parish priest of St. Augustine of Canterbury and our present parish priest. After training with the Canons Regular of the Lateran, at University College, Dublin and at Oscott Seminary, he was ordained on 24th June, 1972. His induction Mass was concelebrated on May 5th, 1985. Great support was received from fellow priests, fellow Christian clergy and parishioners on ‘this most enjoyable and happy day’. Shortly after, the first (and to date, only) ordination in our church took place. Parishioner Robert Rainbow was ordained on July 20th, 1985 by Bishop Mervyn. Robert trained at Oscott Seminary and is currently assistant priest at the Holy Family parish, Swindon. As with any developing community, change is inevitable. Time has witnessed many changes, as, for example, the interior of our church. The tabernacle, originally on the main altar, is now in the Blessed Sacrament side chapel. While the main altar is the focus for Mass, with lectern, people and celebrant, the tabernacle becomes the focus for prayer with its own area. The chapel is also used for weekday Mass. The font is now situated to one side of the Sanctuary, while the former baptistery has become a permanent shrine to Our Lady. The new porch side entrance has resulted in a warmer church and greater access for display and notices. The double doors of the previous entrance can still be used and serve as a fire door. Additional lighting has been installed to enhance the Sanctuary, in particular the main altar, the lectern, the ‘chair of Christ’ (for the celebrant), as it is properly termed. A now familiar part of our Eastertide decorations is the 11’ square icon – a painting of the risen Christ on hessian canvas – the work of Sr. Regina of Turvey Abbey. Although several weeks were spent designing the picture, the final drawing and painting took three days: the latter undertaken on scaffolding and Sr. Regina well into pensionable age! Our parish today, bounded by our fellow parishes of St. Peter’s, Brockworth, Stroud and Tuffley, contains an ever-increasing number of parishioners: about 360 coming together for Sunday Mass. As members of the body of Christ we are one family, called to be disciples of the Lord and to continue his mission to the world. Our Lord Himself said, ‘That they may be one, so the world may believe’’. Therefore, ours is not merely an individual task; it is something to share with the rest of the church. We live out this task as a community, a family. The world ‘family’ comes from the Latin word for ‘servant’. Christ said that He ‘came to serve, not to be served’. As His followers, we too must serve the other members of our faith family by using the talents and abilities given to us. Put another way, the priest and people in the parish form an ‘orchestra’: the priest is the conductor, the people each play their own instruments, but together all are meant to be ‘in harmony’ to produce the ‘symphony’ of praise through their prayer and their lives. The music ‘score’, the talents to ‘play’ the instruments are God’s. So, just as the conductor needs the players, so the players need the conductor and each other. This essence of serving each other and this community-building spirit is being fostered among us, especially by the present ‘Ministry of Talent’ appeal, making known and offering to all the organisations, societies, activities and groups which are available in our parish to everyone (newcomer and longer resident). It is also a means of welcoming and integrating new folk. The following are some of the ways we can be of service to one another. The results of this appeal have been most encouraging, with over half the parishioners indicating their willingness to play their part in the ‘orchestra’! Our parish-in-council meets every three months. The replacement of the Sunday evening Mass by a Saturday evening Mass has been one result arising from these meetings. Change has been and still will be inevitable, following the teaching of the Second Vatican Council, where all Catholic Bishops met to guide the Church ‘for our times’, as we reflect that we are all part of a Pilgrim Church, journeying in faith and loving service. So, for example, the ‘Rite of Christian Initiation for Adults’ (RCIA) is one official way in which our parish, as part of our Deanery, Diocese and wider Church, is responding to the Bishop’s call for a renewed approach to ways of living our Catholic Christian faith. This approach involves the whole community in a process of welcome, instruction and sharing of faith. It is also adapted for the parents and children beginning Holy Communion and for Confirmation candidates. (Even though it is primarily geared to adults taking part in the ‘Journey of Faith’ process, both present Catholics and those seeking to possibly join in Communion and community with our Catholic Church). A further example is that lay men and women are now given – again – an opportunity to share closely in giving of the Holy Eucharist – as was the case in the early Church. They may distribute Communion outside Mass, especially to the sick and housebound. In April, 1987, a Silver Jubilee Committee was formed to organise appropriate celebrations and fund-raising events to mark our Jubilee year. Nearly £700 has been raised by coffee mornings, disco parties, bingo sessions and a bazaar. An unexpected event took play in July 1987. We were given a unique opportunity, privilege and challenge to share our faith via a nationally televised Mass. Our Mass was televised live on ‘Morning Worship’ ITV at 11.00am on July 12th. Judging from the numerous communications received, a huge impact must have been made. This event was one of the highlights of our Jubilee Year. Bishop Crispian Hollis has agreed to come later this year to bless our renewed Shrine of Our Lady and celebrate Mass during this Marian year. Some time ago now, much of the original leaded windows of the former baptistery had been vandalised. Parishioners have donated the fifteen replacement windows. These were designed by Brother Gilbert (Prinknash Abbey) and are being installed by a parishioner’s husband. The Shrine will contain the renovated statue of Our Lady on a special stand crafted by Michael Whitmarsh-Everiss. In September, 1987, Christopher Whitehead, one of our faith family, commenced training for the priesthood at Oscott Seminary. He was our regular organist for over two years. So, at a parish meeting, it was unanimously agreed to make him the 1987/88 ‘Parish Project’, supporting him both materially and spiritually. Our first and previous Parish Project was the Eye Camp appeal, which raised the magnificent amount of £1,120. The highlight of our Jubilee Year is to be on Friday, May 27th, the feast of St. Augustine of Canterbury, when Bishop Mervyn will celebrate Mass and dedicate our church. Further events arranged are a flower festival on May 27th, 28th and 29th, where the theme is the seven Sacraments. Commemorative plates and this souvenir booklet will be on sale. A parish dinner dance is to take place on June 25th at our St. Peter’s High School, Stroud Road. This is a time of rejoicing and celebration as we look back to thank God for all the graces and blessings received. Grateful thanks go to all for making their contribution to our parish history – those of the past who are departed and those of the present for their continuing contribution to our parish. We also look forward with a renewed resolve that our faith and community spirit will be nurtured and strengthened – and passed on to future generations. It is an enormous privilege for me to be able to welcome you to St Augustine’s Church. Unlike its sister, the Anglican Parish Church of St Katharine, our church was built during the 1960s in a modern style. Today its crisp angular lines, its obvious simplicity, couched in quality contemporary materials and oozing fine workmanship makes it well worth a visit. Entering the building one is conscious of its chunky glass which shimmers in the sunshine and has a gem-like quality. When St Augustine’s was opened the space would have felt different as a bold colour scheme highlighted the dominant features. Even though many of the furnishings have moved and more of the windows have been glazed the awe inspiring carved crucifix by Patrick Conoley and the striking window of St Augustine of Canterbury by Pierre Fourmaintraux have not been unduly compromised. These items speak eloquently of the faith which is celebrated here Sunday by Sunday and of our rich Christian heritage. Come in, enjoy our church, and help us to pass on this jewel box to future generations of Matson people. The cross is of roughened and polished oak. The figure of Christ was carved in lime wood by the late Patrick Conoley of R L Boulton and Sons Ltd. The stained glass window depicting St Augustine of Canterbury was designed by Pierre Fourmaintroux, a Frenchman, of Whitefriars Studio of Wealdstone, in Middlesex. The firm was a pioneer in this country of the art of creating Dalle de verre stained glass. This entry was posted on April 28, 2016 by Richard Barton in Gloucester area and tagged Canon Chard, Canon Roche, Egbert Leah, English Martyrs Tuffley, Gloucester, Gloucestershire, Matson, Patrick Conoley, Pierre Fourmaintroux, Richard Barton, Robinswood Hill Parishes, Roman Catholic, Southfield Road, St Augustine's Matson, Tuffley, Whitmarsh Everiss.